Rescuers work at a tourist site in Jiuzhaigou county in southwestern China's Sichuan province after a strong earthquake struck. 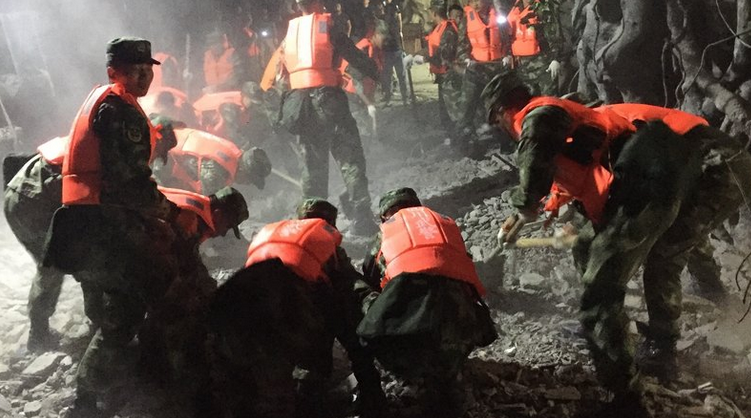 Rescue workers in China are still sifting through debris in the hunt for survivors of an earthquake that left at least 19 people dead and around 250 others injured in southwestern Sichuan province, according to China's Xinhua news agency. The quake struck in a mountainous area at 9:19 p.m. local time Tuesday, near the popular tourist destination of Jiuzhaigou — a national park known for its dazzling vistas of lakes, waterfalls and mountains. It is peak tourist season there, and a number of tourists were among the dead, Xinhua reports. "The tourists were in panic when the quake struck and there were also stones falling down the mountain," Ye Zhi, a villager in Zhangzha told the news agency. Many of the roughly 38,000 tourists were evacuated from the area safely, NPR's Anthony Kuhn reports from Beijing. He says, "Some buildings in the area collapsed, and power and cellphone services were disrupted." Around 1,000 workers were involved in rescue and recovery efforts. And while fallen rocks and landslides have complicated efforts, Xinhua says most of the debris that had been blocking roads was cleared by Wednesday morning. "I was getting into a car at the time of the quake, and it felt like a heavy-duty truck rumbling past," resident Liu Yanrong tells Xinhua. The China Earthquake Networks Center reported that the earthquake had a magnitude of 7.0, while the U.S. Geological Survey gave it a magnitude of 6.5. Don Blakeman, a geophysicist with USGS, tells NPR that it is typical for different magnitudes to be reported because seismologists can use varying formulas to calculate them. Earthquakes are not uncommon in Sichuan province. In 2008, a devastating 7.9 magnitude quake left some 90,000 people dead or missing. Of Tuesday's quake, Anthony says state media reported that "the quake struck during a performance about the 2008 disaster, killing one artist. The report says that at first, some audience members thought the shaking was just part of the show." "It is a very mountainous region in southwest China, Tibet and Nepal," Blakeman said, "and almost all of these earthquakes are related to plate tectonics and these plates moving around."